LEND Lease has been appointed to build the University of Strathclyde’s £89m Technology and Innovation Centre (TIC) in Glasgow city centre. This follows a single stage competitive tender submission in which Lend Lease outperformed competition from four other leading construction firms. 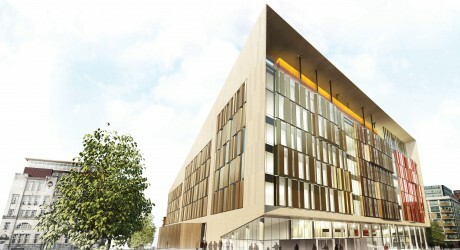 The Technology and Innovation Centre will bring together academics, researchers and project managers from the university and its leading industrial partners to find solutions to challenges in sectors central to economic regeneration in Scotland and further afield, including power and energy, health and advanced engineering. It will be the first of its kind in Europe and will become the cornerstone of the International Technology and Renewable Energy Zone (ITREZ) – Scotland’s hub for global green energy developments. The triangular, nine-storey, steel-framed building will be constructed on a 25,900m2 brownfield city centre site adjacent to the university over an 87-week period. It includes open plan offices, three lecture theatres and specialist laboratory space. The facility will be built to Energy Performance Certificate (EPC) ‘A’ rating standards – the industry’s highest energy-efficiency standard. Lend Lease executive director, Michael Dyke, said: “The Technology and Innovation Centre will be a global centre of research excellence and winning the contract is a great result for Lend Lease. “We are particularly excited about working with the University of Strathclyde to bring economic, sustainable benefit to the local community through the involvement of small businesses, social enterprise groups and employment of new entrants to construction. “Lend Lease is currently building some of Scotland’s biggest and most technically challenging construction projects, including The Hydro in Glasgow – a 12,000-seater venue which will bring the biggest acts in the world to the city. Dr Steve Graham, executive director of the Technology and Innovation Centre at the University of Strathclyde, said: “The Technology and Innovation Centre is designed to transform the way businesses and industry work together to find solutions to global challenges, and bring economic advantage to Scotland.